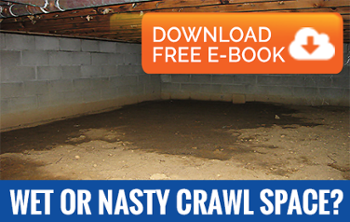 What Causes Crawl Space Moisture Issues? Many crawl spaces have an exposed earthen floor, which allows ground moisture to evaporate into the space under your home. This increases the moisture levels in both the air and sub-structure of your home. Improper grading and lack of rain gutters can also contribute to crawl space moisture control issues by allowing unwanted rain or ground water to enter the crawlspace. Poor crawl space ventilation compounds the problem by creating a mix of warm and cool air causing surface condensation, further increasing the amount of moisture under the home. This repeated wetting of building materials day after day provides the perfect environment for mold growth, termites and structural damage under your home. AdvantaClean experts can diagnose your crawl space moisture issues and crawl space mold issues by properly identifying, recommending and implementing corrective actions. Our crawl space ventilation and mold specialists can perform professional mold remediation in conjunction with addressing the moisture source-- from simple repairs to comprehensive vapor barriers, crawl space ventilation systems and crawl space dehumidifier installations.